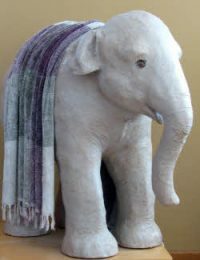 You can display this happy baby elephant on your own wall, or give her to someone special. 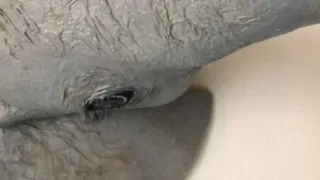 Everyone who sees this big baby elephant falls in love with her. And you can proudly tell everyone you made it yourself! 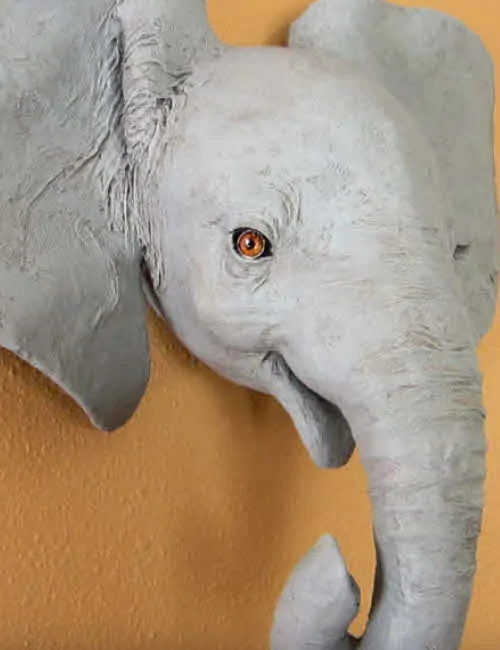 This baby elephant wall sculpture takes some patience to build, but if you go slowly and follow the detailed instructions that are included with the pattern, it’s surprisingly easy to make. The pattern creates all the realistic shapes for you – even that delightful smile! She’s too young for tusks, but she’s still pretty darned big! Finished size: about 19.5 inches (496 mm) high, 22.25 inches (566 mm) wide and 9 inches (231 mm) deep. 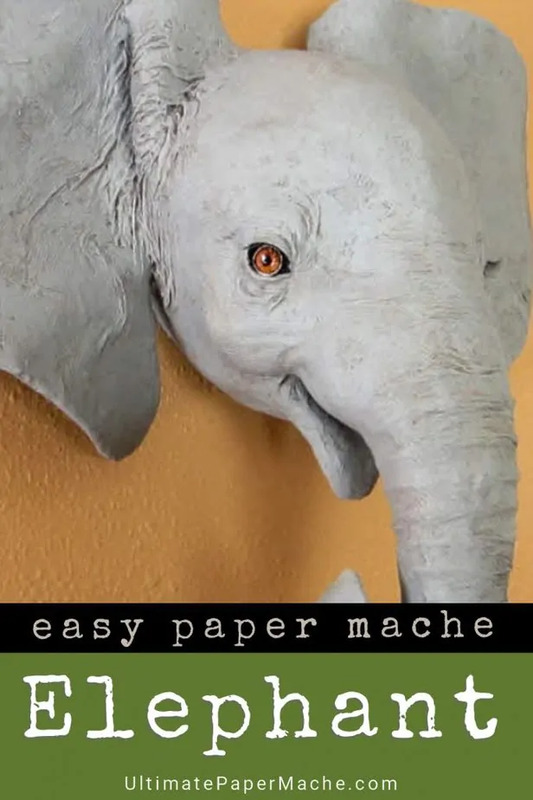 Watch the video below to see how to make your paper mache elephant sculpture. The final skin is made with paper towels. That’s how you can get those nice wrinkles around her ears and eyes. Clear fingernail polish will make your elephant’s eyes bright and sparkly. There are quite a few pieces in this pattern, but if you take your time and follow the instructions on the pattern and in the video you’ll end up with a beautiful wall sculpture. It’s sure to impress anyone who sees it. Aluminum foil, shredded paper or foam packing peanuts for stuffing inside the pattern to support it. The foam peanuts are my preference, but the other options will also work. 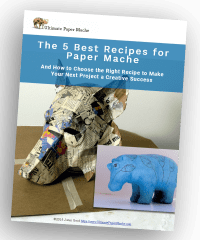 Paper Mache (use paper strips and paste or paper mache clay. Recipes can be found on my website. 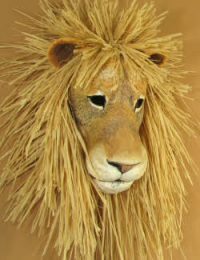 Just click on the Paper Mache Art Library at the top of the site. Gesso (home-made recipe can be found on my website. Or you can use acrylic gesso from the art store. Acrylic paint and gel medium for the eyes. I also used a spray can of gray primer and two tiny pieces of black paper for the pupils. These items are optional. *You can find this in the housewares department of Walmart, or order it online. Or just use clear tape. It keeps the cardstock from getting wet when you add your paper mache. Hi Claudia. 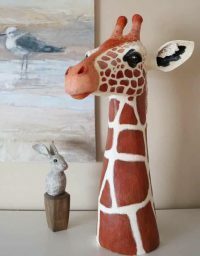 Do you want to use the paper mache clay like real clay? If so, I don’t think it’s going to work. It needs to be used in a thin layer so it can dry quickly all the way through. An air dry clay like Das modeling clay might work better for you. 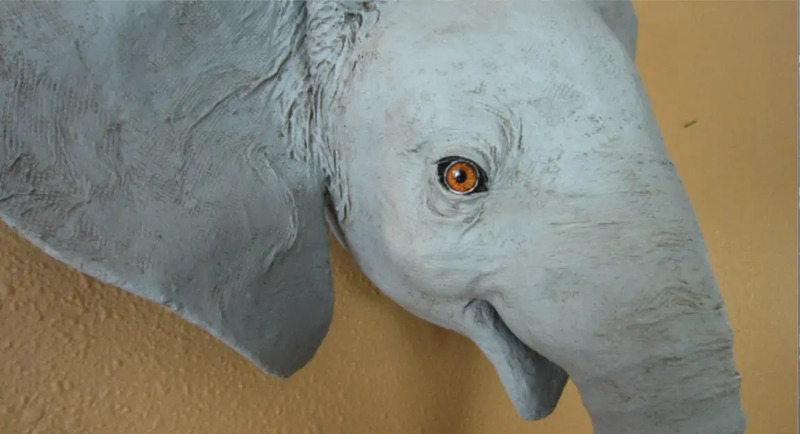 Hi Jonni, I love your work all the time, you are super talented, it’s amazing… so we recently got a film studio and we are trying to do sculptures to give it a more eclectic look, so you think I can modify this baby elephant pattern to get something close to an adult elephant, maybe adding a tusk and removing the cheerful smile? 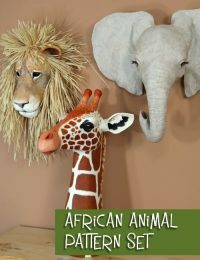 Do you have a pattern for a life sized African elephant head pattern. Or do you know where I might find a good one like yours? Hi William. This pattern is for a life-sized baby African elephant. 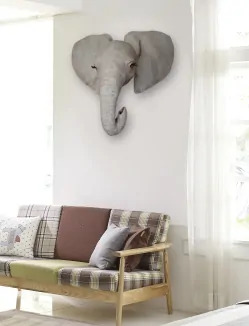 Are you looking for an adult elephant head? I don’t actually know anyone else who creates patterns for realistic sculptures. (They take me over a month to design, so I can see why there isn’t much competition. 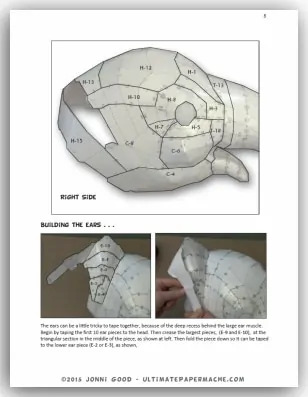 🙂 ) However, there are some artists who sell low-poly papercraft patterns, and you might be able to use one as a base for a realistic sculpture, with a bit of work. 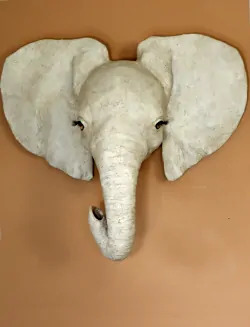 For instance, this etsy shop has a papercraft elephant, but she doesn’t mention how big it is for some reason. I am so fascinated with your animal masks especially the elephant. But my question is: should I start with something small, perhaps the wolf or cougar? I am 72 and bored silly. Thank you so much. Hi Carol. I don’t think the size of the project would matter very much – after all, you only work on one piece at a time. The elephant pattern has tabs that help align the pieces, but the numbers on the tabs are a quite small and some of the pieces are small, too. The wolf might be an easier pattern to start with, just because the pattern sizes are a little larger. Both are fairly easy to do, though, if you have the patience to go slowly. Have fun! Hello Jonni! Are you available to chat on facebook or something? I have so many questions! I am trying to find a way to strengthen my statue i built! Hi Warren. I don’t do chats, but I’m always happy to answer questions. In fact, if you ask over on the Daily Sculptors page, some of my readers might be able to help, too. Be sure to attach a photo to your comment, if you can, so we can see the problem more clearly. I thank you so much for the pattern. In the past I told you I would use the patten for a hair show. Just wanted to show you the entire look it came amazing. Not quite the traditional look. Victoria, if you tried to upload a photo with your comment, I’m afraid it didn’t come through. The file size needs to be less than 250 kb. I do hope you’ll edit the photo and make it smaller, because we really want to see how it came out. What an intriguing idea! Thank you so much for your beautiful patterns and of course all your video’s! It make’s all a lot easier for us! You’re welcome, Ilja! Your elephant really turned out nice. Thank you so much for showing her to us.